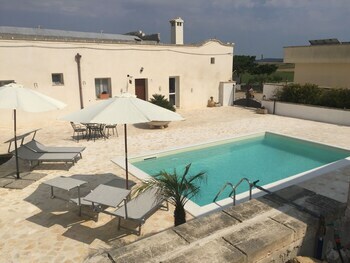 With a stay at Masseria 25 Anni in Laterza, you'll be 9.9 mi (15.9 km) from Rudolph Valentino Museum and 12.5 mi (20.1 km) from Caduti Monument. A roundtrip airport shuttle is provided for a surcharge (available 24 hours), and free self parking is available onsite. Located in Vanze, Agriturismo Villa Conca Marco is in a regional park, a 4-minute drive from Le Cesine Nature Reserve and 6 minutes from Lido Le Cesine. Free self parking is available onsite. With a stay at Poggio Del Sole in Cortona, you'll be within a 15-minute drive of Lake Trasimeno and Santa Maria delle Grazie. Free self parking is available onsite.